As an updated and renamed version of Stetzer’s 2003 text, Planting New Churches in a Postmodern Age, Planting Missional Churches seeks to ride the wave of enthusiasm among evangelicals for all things “missional” and seemingly targets an audience of young conservative (male) would-be church planters. As a result, the writing style is down-to-earth, pastoral and practical rather than deeply theological or academicly sophisticated. With twenty nine chapters, there are few, if any, aspects of starting a new church that Stetzer doesn’t treat. Given that each chapter can not be addressed, this summary will focus on the five “major messages” of the book which Stetzer identifies in chapter one. He links each with a key word: missional, incarnational, theological, ecclesiological, and spiritual (2-3). According to Stetzer, being missional means assuming the posture of a missionary—one sent—as Jesus was—to “seek and save the lost.” Stetzer’s opening chapter seeks to establish church planting as the most appropriate missional response to what he portrays starkly as a North American church in decline and growing ranks of non-Christian Americans. Being missional, for Stetzer, means taking action to reverse these trends, and he presents planting new churches as the proper remedy, touting it as both the “most effective method of evangelism” and the biblical response to the church’s “decline” (14). Chapter two is devoted to “redeveloping a missional mind-set” and invokes classic quotes from Newbigin, Bosch and Kahler to present the church as the sent agent of a sending God, and as the instrument of the missio Dei, a popular term which Stetzer invokes but leaves disappointingly unspecified. In chapter three, Stetzer looks to the Bible to establish a connection between the mission-imperative given to the church and church planting as the normative way of fulfilling it. In so doing he echoes four themes common in missionary literature since beginnings of the Protestant mission movement. The first of these relates to the Great Commission—to which Finney appealed—but rather than focusing solely on that single Matthean text, Stetzer identifies four commissionings of Jesus. First, “I am sending you…” (John 20:21) is highlighted as a crystal clear instruction to “pick up Jesus’ earthly work and continue doing it,” especially his work of seeking and saving the lost (38). Second, Stetzer notes the call to “make disciples of all nations” which is taken to indicate a focus upon evangelizing and congregationalizing every people group (39-41). Third, he clips a few words from Luke 24:47 to construct the third commissioning, to “preach repentance and forgiveness” (41). Fourth, and finally, Stetzer notes that Christian mission is intended to expand from Jerusalem to the ends of the earth, indicating it is properly thought of as a task with both local and overseas dimensions. The second common theme Stetzer includes is the imperative that mission focus on non-Christian (“unchurched”) persons. Third, Stetzer looks to Paul as the missionary church planter par excellence. The fourth and final common tack is found in Stetzer’s appeal to the book of Acts as both proof of the normativity of church planting in missionary work, as well as a church planting strategy sourcebook. The second critical message which Stetzer identifies is the need for church planting to be incarnational, that is, to seize the opportunity unique to new churches to “indigenize in ways that established churches rarely can accomplish” due to the baggage of tradition-shaped expectations (32). This entails starting “new churches that are fresh expressions of the unchanging gospel, new missional contextualized churches in every setting across the globe” (25). Chapters nine and ten exemplify Stetzer’s approach to incarnational church planting. In “Understanding Cultures and Models” he asserts the need for cultural exegesis that takes into consideration generational and ethnic differences so that churches may be planted “in the heart language” of all of North America’s people groups. While this chapter has a positive culture-friendly approach, “Church Planting in Emerging Culture” takes more of a critical one as it stresses the need to reject certain parts of contemporary culture, particularly postmodern presuppositions which he deems “antithetical to the gospel” (126). Stetzer proposes several incarnational strategies for reaching emerging postmoderns, including “being unashamedly spiritual,” “engaging in service” and “leading by transparency and team” (135-6). 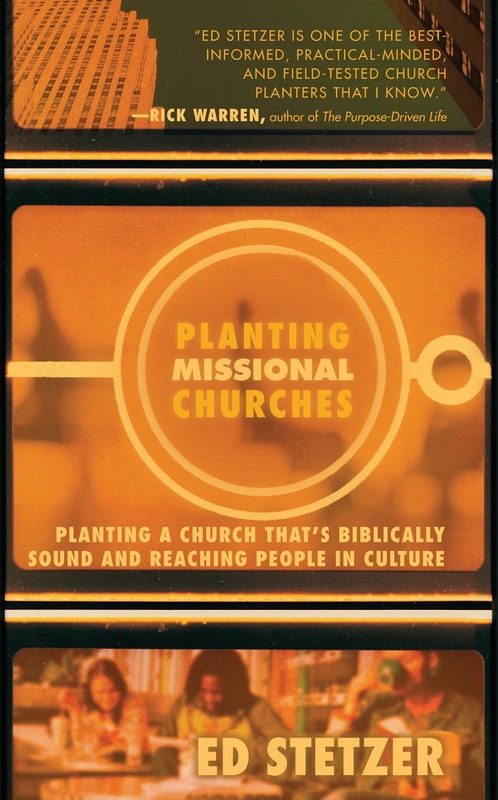 In chapter thirteen, Stetzer discusses one model of church planting that is most illustrative of his incarnational message, missional/incarnational churches (MIC’s). In contrast to the models of church planting which are dominant—and which the bulk of the book seeks to enable—MIC’s “let their incarnation of Christ drive the mission in their community and beyond; and the church emerges out of that journey” (161). The focus in this approach is on building relationships and serving rather than recruiting members and launching. The covenant communities resulting from these other-oriented relationships, then, have the potential to incarnate the gospel in a uniquely local and specific way. Third, Stetzer strives to convey the importance of theological considerations regarding church planting. Perhaps typical of conservative evangelicalism, Stetzer understands proper theology to be simply the restatement of the static deposit of truth that the Bible provides (2). This commitment to “biblical theology” shines through most clearly in passages throughout the book when Stetzer speaks of the “unchanging gospel” which is to be contextualized but not altered for various cultural settings. Indeed, he suggests that although “cultures and people are different, the gospel is the same for all of them” (116). As hinted earlier, he regards the gospel as the message of repentance and forgiveness of sins through the substitutionary atonement of Jesus on the cross (41). As a subset of theology, Stetzer’s ecclesiology—the book’s fourth key message—has a similarly dogmatic tone, which is clearest in chapter twelve where he outlines his view of the biblical requirements in order for a church to be a church. First, it must be a “covenant community” with boundaries such that “some are part and some are not” (158). Second, to be a church it must meet. That is, a group that connects irregularly or online is not a church. Third, it must be working toward biblical leadership that fills the normal offices which are described in the New Testament. Fourth, churches celebrate the ordinances of communion and baptism. Fifth, Stetzer asserts, the preaching of the word must take place for there to be church, though the form which the preaching takes is not commanded. Clearly, for Stetzer, church planting can not approach ecclesiology as a “blank slate to draw out of the cultural situation” (159). Finally, Stetzer identifies his fifth basic message as the need for church planters to approach the work spiritually, rather than merely on the basis of their own entrepreneurial ingenuity, charismatic personality or disciplined work ethic. The key practice in this regard, according to Stetzer, is prayer, which he notes many church planters neglect early on, but are eventually driven to by the desperation born of the work (97-98). Prayer is essential as both the means of personal encounter with God, leading to transformation toward Christ-centeredness and as the means for finding the peace and strength needed to succeed in the work of church planting. Stetzer also refers to prayer as a source for guidance regarding planting strategy (99). Stetzer’s book makes several noteworthy contributions. First, the simple comprehensiveness of the issues covered offers the reader and potential practitioner a good sense of the questions with which a church planter must grapple, whether or not they agree with Stetzer’s own convictions and recommendations. Second, the book draws freely upon the work of other oft-noted texts, frequently synthesizing paradigms and conclusions clearly. As a result, it serves as an introduction to some of the most influential ideas circulating in conversations about new church development. The annotated bibliography at the end of the book (and the updated version on his website), similarly offers the reader a sense of the wider field, though the annotations are generally lacking in substance beyond Stetzer’s own personal evaluation. 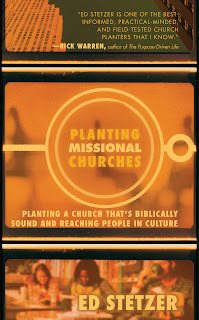 The third key contribution of Planting Missional Churches is Stetzer’s acknowledgment of a coming sea change in the practice, which he calls a “church-planting fault line” (152). Drawing on Revolution by George Barna and The Shaping of Things to Come by Frost and Hirsch, Stetzer perceives a shift on the horizon away from the Constantinian model of church as pastor + program + building toward simpler, more relational and organic expressions of Christian ecclesial life. Stetzer has his misgivings about this trend, which he believes often underemphasizes biblical criteria for church (mentioned above) in favor of expressions that are sourced in missiological readings of culture alone without deference to Scriptural mandates. Moreover, he observes that while many church planters, himself included, are drawn to simpler approaches, many of those involved are motivated by emotional reasons—having been disappointed by the institutional church—rather than missional ones (156). While the three chapters devoted to this transition and these models of church planting expand the vision of the book considerably, the overwhelming majority of the chapters are clearly intended to facilitate the more common launch-based church planting strategy and traditional ecclesial expressions. The greatest shortcoming of Stetzer’s work is the productionistic/conversionistic logic which governs his understanding of the missiological task and is evident throughout. As noted above, while Stetzer admits to longing for the house church model to become the norm, he has refused to step into that movement on the basis of his understanding of the missiological task: “As a missiologist, part of my role is to ask if certain models are being effective in culture. Right now, Koinos [house church] models have not be able to break through into the cutlure(sic) of lostness as a few more common models have” (173-4). For Stetzer, the ultimate measure of missiological success is “effectiveness” at reaching and saving the lost. As a result, models for church planting are finally to be evaluated by numerical outcomes. His research through the North American Mission Board makes even more clear this productionistic outlook, since it looks to the number of baptisms and church attendance to measure church plant vitality. Such a results-based vision of Christian mission finally hamstrings any attempt at faithfully incarnational ministry. Illustratively, he instructs planters to “abandon a model-specific vision” and bring the gospel into a context asking the question, “What cultural containers—church, worship style, small group ministry—will be most effective in this context?” (160). When effectiveness is measured by attendance and baptisms, incarnationality ceases to be about following the pattern of Christ. Indeed, for Stetzer being incarnational is reduced to a mission strategy (contextualization); it is not, therefore, regarded as an essential measure of the faithfulness of mission efforts to the God whose earthly mission was arguably an abysmal failure in terms of the mass production of disciples. While Stetzer warns church planters of the “danger of unspiritual pragmatism” he seems to have unwittingly succumbed to it. Believing that it is the missiologist’s job to advertise and promote what “works”, Stetzer’s recommendations are stripped of concern for practicing church planting virtuously. This end-justifies-the-means logic is most evident in his verdict on the question of how church planters ought to go about gaining attenders: “The planter should use every available means to contact and invite unchurched and lost persons [including]…door-to-door visitations, prospect listing, [and] telemarketing…” (196-7). While it is not my intention to off-handedly condemn these practices as definitively unfaithful and unvirtuous, it is unmistakable that Stetzer’s guide for evaluation is results, plain and simple. Admitting that mailers and phone calls have a low percentage of pay-off (he cites a 0.5% response to core development mailers) and are occasionally greeted with hostility, he neglects to account for the effect of such marketplace methods on the thousands who seemingly ignore such ploys; blanket advertizing may produce two dozen church attenders, but how has it represented the Christian gospel to the thousands who now justifiably liken it to a sales campaign? 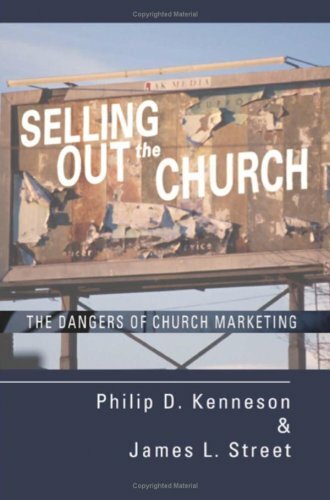 Kenneson and Street, authors of Selling Out the Church: The Dangers of Church Marketing, make a compelling case that the logic operative in such approaches is that of the market in which people are inscribed as consumers, salvation and the church commodified as goods and services and evangelism reduced to a sales pitch. As such, the gospel ceases to be offered as a gift, because the encounter becomes one of exchange in which the provider (church) offers goods (salvation, community, meaning, inspiration) in return for participation and affiliation. In agreement, I conclude that the faithful practice of Christian witness through church planting is incompatible with a willingness to use “whatever means are necessary” (205). The pragmatism of Stetzer’s missiological conscience prevents me from recommending Planting Missional Churches to aspiring church planters, but I will commend it as a key text for those, like myself, who seeking to understand the theology and practice typical of the conservative American Evangelicals who have driven a huge increase in church planting in recent decades. Stetzer—not only through books like Planting Missional Churches, but via his popular website and other media channels—is a key source for this movement which is changing the landscape of congregational life in the U.S. and establishing a paradigm for North American mission thought and practice. Stetzer, Ed. Planting Missional Churches. First ed. B&H Academic, 2006. Find more posts on Ed Stetzer here. Check it out, I'm sure it'll be a blessing and source of great spiritual enlightenment.